Dubai is famous for its stunning skyline and modern architecture. Tourists from across the globe visit Dubai to view its impressive feats of engineering and spectacular record-breaking buildings. Being the most populated city in the United Arab Emirates (UAE), it has a number of high-rise towers with 88 of them boasting imposing heights of over 180 m (591 ft). Built with the latest innovations and modern technology, buying or renting an apartment in these towers is often seen as a symbol of wealth, success and prosperity. Burj Khalifa is one such high-rise edifice, that is well-known globally as an emblem of Dubai’s modern architectural accomplishments. It is 828 m tall and contains 900 apartments. If you want to know about Dubai’s iconic buildings and towering skyscrapers, read on to find about the tallest residential towers in the city. When it comes to finding super-tall residential towers with amazing views and luxury amenities, there is certainly no shortage in Dubai. Some of these towers are emblematic of the city’s meteoric rise as a global hub of real estate innovation and are a testimony of the great heights the city has achieved in a short span of time. Let’s take a look at some of the tallest residential buildings in Dubai, perfect for those looking to rent or buy apartments in the city. Those in Dubai know Princess Tower as the undisputed star of Dubai’s skyline. Once the tallest residential building in the world, this iconic landmark is now the second tallest residential tower in the world and the third tallest building in the city. Located in the uber cool area of Dubai Marina, it is a 414 m tall, 101 storey building that contains 763 residential units, 8 retail spaces and 957 slots for parking. The tower contains penthouses too, so if you are fond of stunning landscapes and beautiful views, these luxury flats make an ideal choice! Just like the other postmodern residential buildings of Dubai, it is a visually stunning masterpiece with a decorative crown and a dome topped with a spire. If you are looking to rent apartments in Princess Tower, based on the current listing on Bayut, prices start at AED 65k. Princess Tower is an iconic landmark in Dubai. If there was a physical epitome of luxury elegance in the form of a skyscraper, 23 Marina, one of the tallest residential towers in Dubai would fit the bill. Located in the ever-expanding metropolis of Dubai, 23 Marina is an 88-storey, 1,289 ft skyscraper that houses a 6-storey high entry hall featuring beautifully-designed slanted glass walls and flooring. Featuring 2 and 3-bedroom apartments and 4-bedroom duplex flats, the building has several outdoor swimming pools and 62 working elevators along with 4 underground floors. If that doesn’t sound impressive enough, this meticulously landscaped development has a running track, health club, and spa. If you plan to rent an apartment in 23 Marina, please note that prices start at AED 125k based on current listings. One of the tallest residential buildings in Dubai, 23 Marina is a popular choice for both buyers and renters. One of the exciting, towering residential buildings in Dubai, Elite Residence stands 1250 ft tall, consists of 91 floors, with a selection of luxury amenities making it a popular choice among the city’s elite. 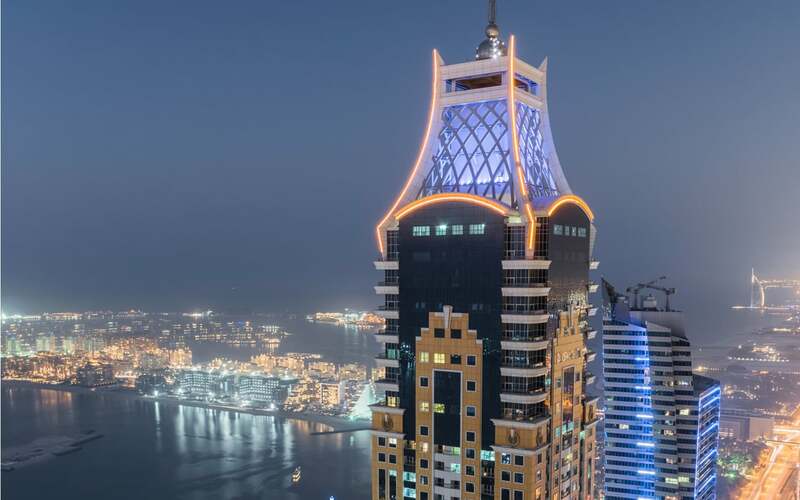 Situated in Dubai Marina, this building narrates a tale of architectural finesse and magnificence. At the time of its completion in the year 2012, Elite Residence was the third tallest residential building in the world. However, after the completion of New York 432 Park Avenue, it slipped further down in the list of tallest residential buildings in the world to the fourth position. The building has 695 apartments which are spread across 76 floors with shared swimming pools, gyms, jacuzzi, sauna, and even business centres! Those looking at leasing flats in Elite Residence would be happy to know that according to current listings on Bayut prices start at a reasonable AED 65k. The gorgeous views from Elite Residence makes living here a fabulous experience. The Blue Tower, also known as HHHR Tower, is a gleaming skyscraper in Dubai that shimmers with the reflections of the sparkling lights on the city’s main artery, Sheikh Zayed Road. With an impressive height of 317.6 m (1040 ft), this 72-storey skyscraper was once considered the second tallest building in Dubai and the fourth tallest tower in the world. Housing 454 residential units and a few commercial units, the tower matches the luxury standards of high-rise apartments in Dubai. One of the tallest residential buildings in Dubai, Marina Torch or The Torch as the building is also known as stands 1,142 ft. tall and consists of 80 floors. There are over 500 apartments in The Torch that you can rent or buy, ranging from 1-3 bedroom units. If you are looking for something more exclusive, the tower also has four duplex residential suites. The building features an array of high-end amenities including pools, fitness centres, and more. The apartments for rent in The Torch start at AED 65k and are extremely popular with the city’s professionals thanks to the easy access to business hubs and recreational facilities. 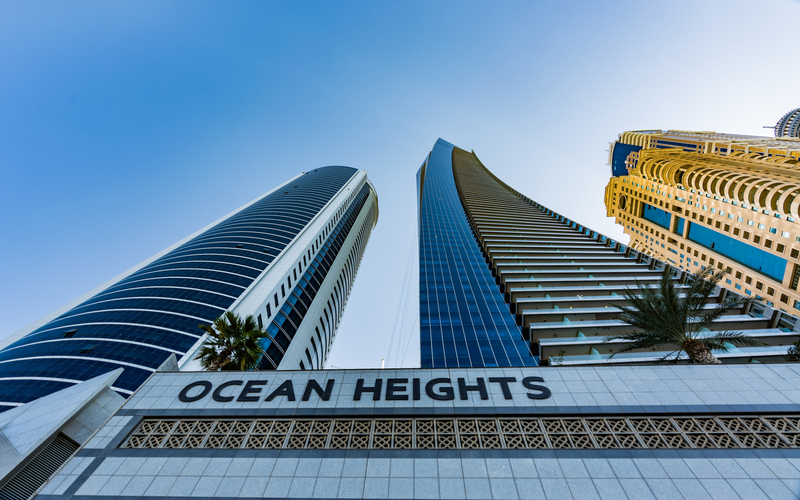 Situated at Al Sufouh Road in Dubai Marina, Ocean Heights is a 310 m tall architectural wonder in Dubai. Designed by Andrew Bromberg of Aedas, it was completed and finalised in the year 2010. As of now, Ocean Height is the fifth tallest residential building in the world and shares the fourth position with the Blue Tower and Marina Torch in Dubai. Initially, two variations of this building were proposed. The first version only had only 38 floors and the second design had 50 floors, hower eventually these plans were changed in favour of a single residential tower. The iconic building that we see today, has 82 floors with 519 residential apartments and multiple elevators. If you are looking to rent flats in Ocean Heights, please note that units in the building are currently priced from AED 75k. Ocean Heights is an undisputed star of Dubai. Inaugurated in the year 2013, this 1080 ft.tall building is considered yet another masterpiece of modern architecture. 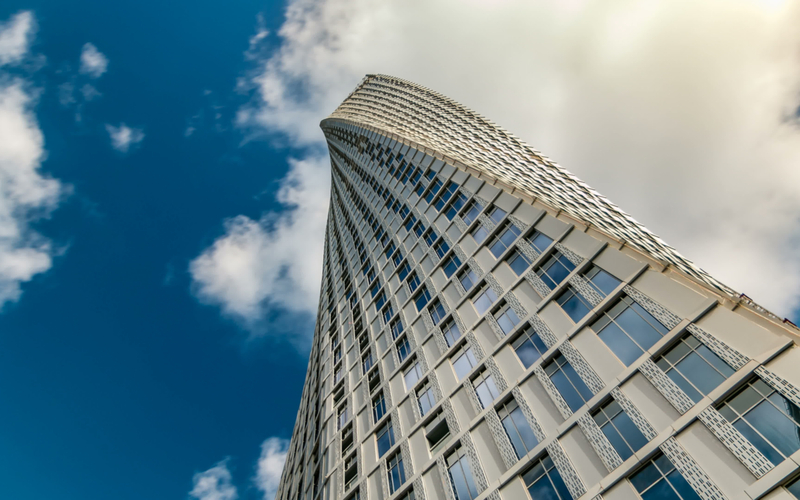 Known for its unique design that features twists at a right angle, Cayan Tower is one of the most well-known among the list of tallest residential buildings in Dubai. Designed by the architectural group —Skidmore, Owing and Merrill SOM of the Burj-Khalifa fame, this 76-story structure has more than a hundred 1,2,3 and 4-bedroom apartments designed to high international specifications. The current prices of apartments for rent in Cayan Tower start from AED 80k. Cayan Tower is another masterpiece of modern architecture. One of the most popular among the tallest residential buildings in Dubai is the Emirates Crown, located across Dubai International Marina Club. A master development project of Bin Shafer Holding and the Design and Architecture Bureau, it is 971 ft high and consists of 2 to 5-bedroom apartments and penthouses that are spread over 63 floors. Construction started in early 2005 and took almost three years to complete. It was officially inaugurated in 2008. 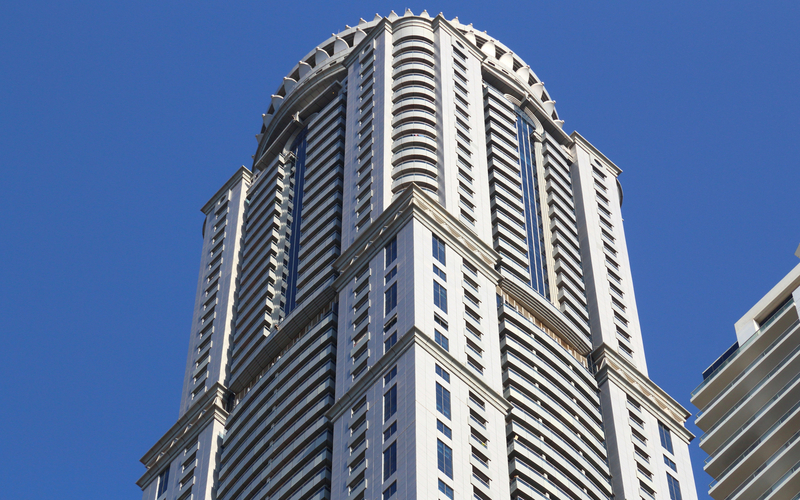 At the time of its completion, it was the 6th tallest residential building in Dubai. The rental apartments in Emirates Crown start from AED 120k as per current listings. Located on the Sheikh Zayed Road, Millennium Tower is a 935 ft tall building that consists of 60 floors. Inaugurated in the year 2006, the tower is home to over 300 units of 3-bedroom apartments and has over 100 units which are 2-bedroom apartments. Formerly known as the Bright Start Tower, this residential tower features a 25 m swimming pool, squash courts, and gymnasium. Located in the proximity of several restaurants including Rossovivo and One0one Restaurant & Café, those renting apartments in Millennium Tower have a variety of choice when it comes to picking a spot to dine after a hectic day. Marina Pinnacle is yet another skyscraper in Dubai which is located in Dubai Marina right next to Marina 101. It stands 920 ft. tall, and has 73 floors and 764 residential units. Completed in the year 2011, it is considered the 19th tallest building in Dubai. It is close to some of the popular restaurants in Dubai Marina including Shami Gourmet, Observatory Bar & Grill and Shooters Billiards & Café. An ideal residential space for foodies in the city, the apartments for rent in Marina Pinnacle are also popular with residents for its stunning views, high-end amenities and enviable location. 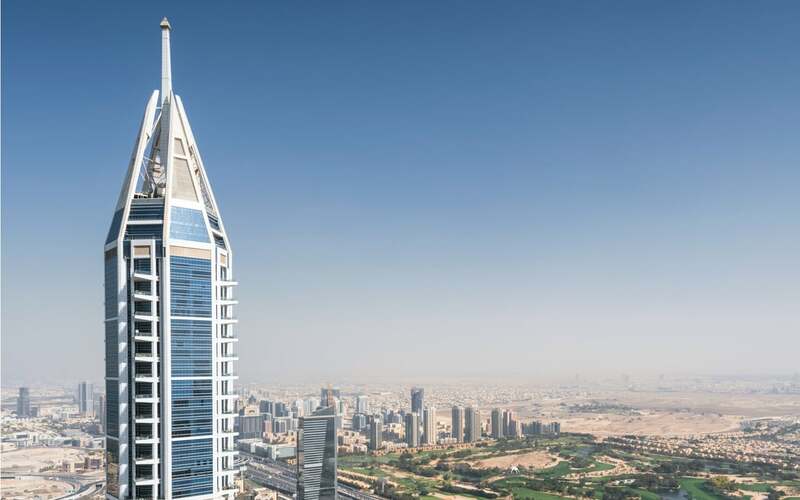 Nestled on the famous Sheikh Zayed Road, 21st Century Tower is amongst the tallest residential buildings in Dubai. Completed in the year 2003, this 55-storey tower is 883 ft tall. At the time of its completion, it was considered to be the tallest residential building of the world but soon the record was surpassed by an Australian building. It has 400 apartments, 7 elevators and 412 parking spaces that help residents enjoy a hassle-free life. The apartments for rent in 21st Century Tower start at AED 90k. Formerly known as “Chelsea Tower”, Al Salam Tower is an 820 ft.tall building that consists of 49 floors. Built in the year 2005, the building is now occupied by the Al Salam Hotel Suites. It is located close to Al Badaa Health Center, and just a few minutes away from another residential building, Tower Rotana. And that concludes our list of the tallest residential buildings in Dubai. Which of these towers are you most interested to buy or rent apartments in? If you are on the fence about whether high-rise apartment living is for you, take an inside look at life in Burj Khalifa, the tallest building in the world! All the services in Dubai Marina Mall you didn’t know about!